Maretron's TLM150 is used to sense fluid levels of tanks by using ultrasonic technology. Ultrasonic, or sound waves, are transmitted via the TLM100 mounted at the top of the tank and the flight times of the sound waves to and from the fluid are measured much like a depth sensor. What this means for you is that there are no difficult to handle long probes protruding into the tank, which often foul and/or corrode. Once the TLM100 calculates and transmits the fluid level over the NMEA 2000� network, you can observe tank levels anywhere on the vessel where there is an NMEA 2000� compatible display such as the Maretron DSM250. The TLM100 is capable of sensing fluid levels in tanks up to 40� (1.02m) in depth. It can be used for diesel, fresh water, waste water, black water, and oil tanks (see TLM150 for gasoline tanks or TLM200 for deeper tanks). Unlike most tank senders that only work with rectangular tanks, the TLM100 can be calibrated for irregular tank shapes so you can know the true fluid level in your tanks. The TLM100 is mounted directly to the top of tanks using the industry standard SAE J1810 5-hole mounting pattern. The TLM100 can also be mounted to tanks with threaded tank openings using optional adapters that included both a 1.5" NPT and a 1.25" BSP adapter. There are other important TLM100 optional accessories including an airlock for black water applications, which keeps the face of the ultrasonic transmitter from fouling and an optional focus tube to permit use on boats with planing hulls, which is required if the vessel spends a significant amount of time with the bow pitched up. 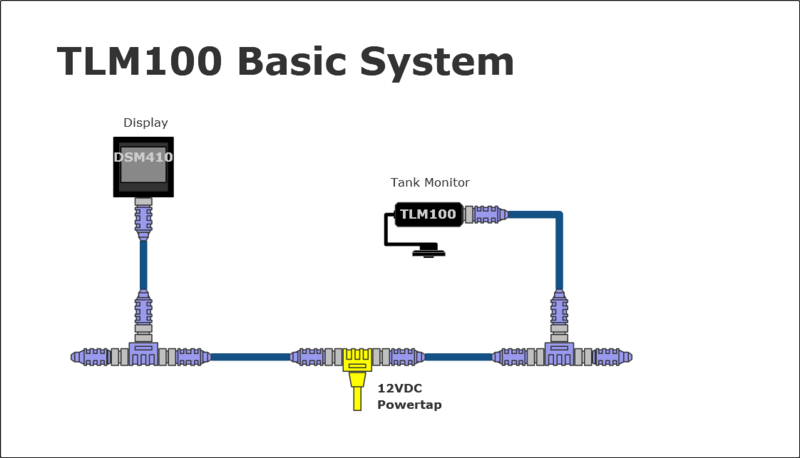 Most importantly, the TLM100 is NMEA 2000� certified so you can view any and all tank levels anywhere on the vessel when using a compatible NMEA 2000� display. The TLM100 is another key component of Maretron's N2KView� vessel monitoring and control system. Maretron�s Tank Level Adapter (TLM100) allows you to observe tank levels anywhere on the vessel where there is a NMEA 2000 compatible display. The TLM100 senses the level of the fluid in the tank using ultrasonic technology eliminiating the need for probes into the tank, which often foul or corrode. This basic tank monitoring system monitors six tanks using Maretron�s 3.5� color display and 6 Tank Level Monitors. The system can be calibrated for odd shaped tanks so you get precision tank level information. And since the tank capacity is programmable, you can see exactly how many gallons remain in the tank. You can even combine different tanks into a single gauge or display, eliminating the need to continually perform mental calculations.